Charlie Batteries 'first' reunion in 30 years took place October 5, through October 9, 2001. 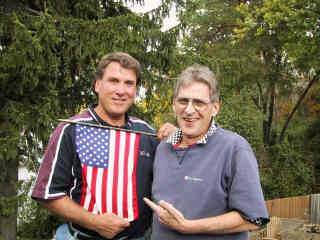 Larry Bourbonnais and John Duggan were the first to get together. 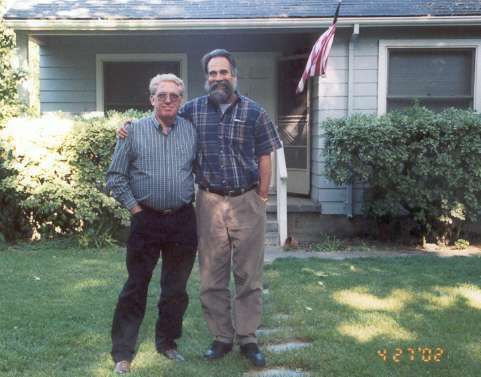 Larry came from Colorado Springs, Colorado to John's home in Waterford, Michigan. I haven't talked to either one directly but the e-mail's have been going back and forth since Larry arrived. Here is a quote from Larry, "Mother Duggan and I really had a flash back today as I read out loud from my diary. We both feel 20 again". Larry kept a diary while he was in Vietnam and in the near future some of the things that he put in the diary will be added to the web site. John found the web site about five weeks ago and on the address page he found his old friend Larry. That goes to show all of us just how small our world is that we live in. These boy's didn't waste anytime in getting together. 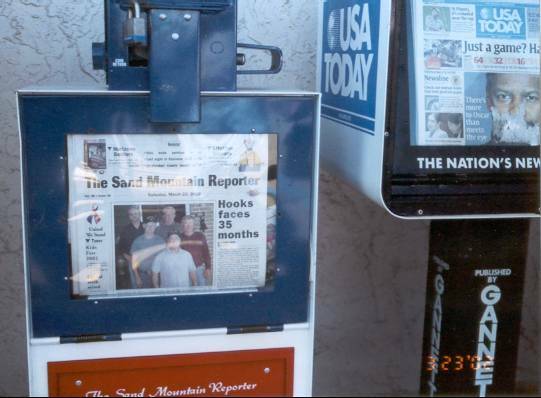 Photo taken on October 7, 2001. Larry on the left and John on the right. Charlie Batteries second reunion took place on Mar. 20-23, 2002, in Boaz, Alabama. My wife, Barbara, and I drove from California, Edward and Carol Cloutier flew in from Maine, Doris Brownell ( Dell Burns' wife) and Sharon McEntyre ( Dell's only sister) flew in from Washington State, Earl and Nita McGreger drove in from Mississippi, and Edward Kiser and his sister Ernestine Davis drove in from Virgina. Alabama (LaVaughn) and his wife, Barbara, Baird live in Boaz, Alabama. Sharon and Doris helped me find Alabama back in October, 2001. 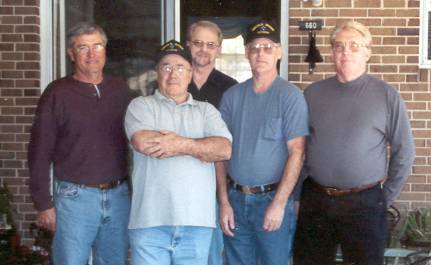 None of the guys had seen one another since 1969 back in Vietnam. Most of us hadn't talked to anyone since we left Vietnam. Each one of us had thought of one another over the years and thought that we would never see each other again. Thanks to the Internet we live in a very small world after all. 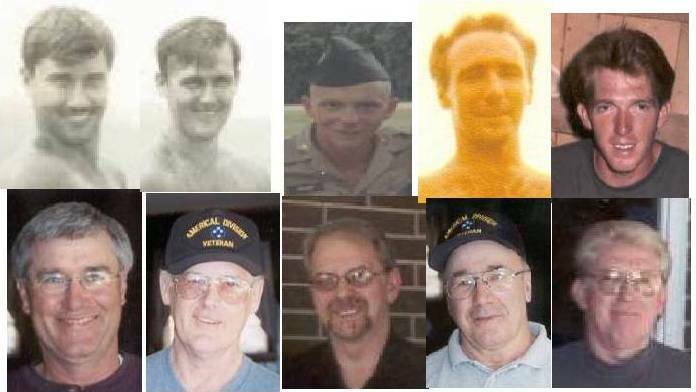 Left to right, Earl McGreger, Edward Cloutier, Edward Kiser, LaVaughn Baird (Alabama), and Clarence Marrs. Clarence Marrs on the left and Rudy Ziegler on the right. Rudy came from Qregon and I came from Porterville and met in Davis. Rudy was our Exec. Officer from June 69 until he went home in August. Rudy was from California and so was I. I tried to connect with Rudy when I came home. I talked to his Mom on the phone the day I went to see him and he was out. Thirty two years later we were able to meet again.